Sahil Alloys and machine tools enhance CNC VTL vertical turning lathe machine that is used for a respective production of duplicate which by their nature of cutting process are usually interchangeable. The construction of this machine has minimized any misalignment or out of suaveness to provide high accuracy. Apart from this, more specification is the maximum swing and turning diameter varies according to the specified capacity of the machine. 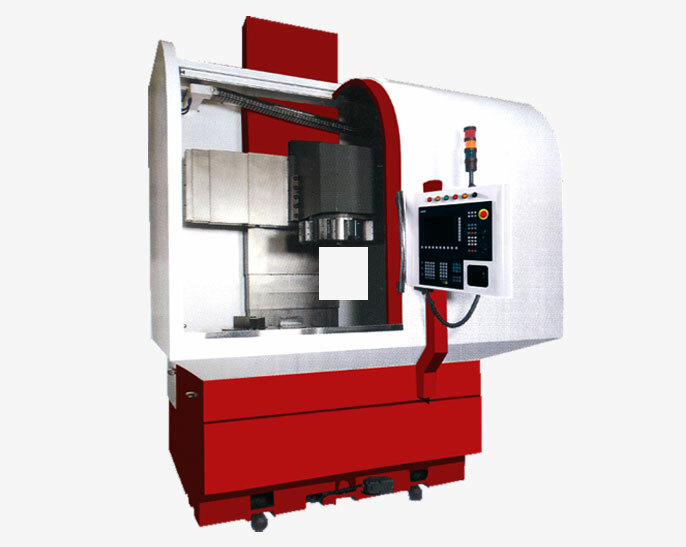 The vertical turning lathes solution capable of meeting and production needs. The RAM head pulls the hydraulic power and to protect the accurate positioning and firm clamping with Automatic tool change (ATC), the number of tool position and cross- section of RAM. The Ram head pulls the T-bolt with hydraulic power to clamp tool holder. To insure error free location and firm clamping of tool holder, Curvic coupling is used between the ram and tool holder. The bottom of double column is steady on both floor and the table base, and the top is fixed against the top beam. However the inclusive construction design is acceptable for heavy loads and heavy duty cutting. Tool holder clamping process of the VTC series is the pull-stud bolt type. To accept both turning and milling tools, the Ram is designed to hold ISO.50 spindle taper. The range of table speed is 3-300 rpm to 3-150 rpm and moreover, it is 2-step change gear speed. This machine is using consequence can be made on own creativity and it is trouble free to utilize. Table with manual 4-jaw chuck as spec. High power motor than spec.